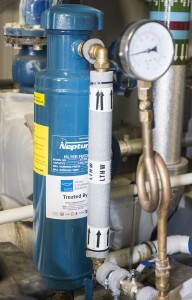 Water Treatment of closed water systems ensure compliance with numerous legislative documents. Closed water systems such as heating and chilled water systems are prone to attack from slime forming bacteria and the effects of scale and corrosion. Both of these elements can reduce the efficacy and life span of closed water systems. Guidance documents such as the BSRIA documents, the BG/29 / BG/50 and the British Standards documents BS7593 / BS8552 provide business users and service providers like Water Compliance Solutions with the relevant information to ensure water systems are treated and maintained to a suitable standard. Water Compliance Solutions can offer advice and solutions to business and private owners on how to best ensure that the water with their closed water systems is treated to provide efficacy and prolong the life span of the system and it associated items of plant. NRB or Nitrite Reducing Bacteria does exactly as it sounds, it reduces or eats the amount of Nitrite in the closed water system. Nitrite is a very good scale and corrosion inhibitor either used by itself or in a multi metal based inhibitor with molybdate as nitrite passivates more efficiently than molybdate. SRB or Sulphur Reducing Bacteria, which use sulphur as an energy source, are the primary producers of large quantities of hydrogen sulphide. These bacteria chemically change natural sulphates in water to hydrogen sulphide. Sulphur-reducing bacteria live in oxygen-deficient environments such as deep wells, plumbing systems, water softeners and water heaters. These bacteria usually flourish on the hot water side of a water distribution system. The mains concern associated with SRB’s is that hydrogen sulphide is corrosive to metals such as iron, steel, copper and brass. Pseudomonas are slime forming bacteria. These slime block up items of plant such as fan coils and plate heat exchangers. Molybdate is usually blended with a small amount of nitrite. The nitrite passivate quickly and attacks the area if corrosion then allow the molybdate to create a film over this area preventing any further corrosion occurring.